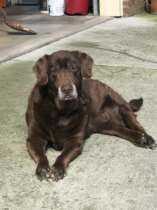 My Rocko was a chocolate lab and we live on the lake. My boat didn’t go out that he wasn’t on it. He was well known on this lake. If he wasn’t riding he was swimming. "Dr. Allie was the sweetest person to go through this terrible moment with. Such a sweet and caring person. I’m so glad I found her."